The search for the perfect symbiosis because not everyone can have an auditorium for music and sometimes the music to be shared at the time and place where it’s better off on the couch to relax alone or with friends .. 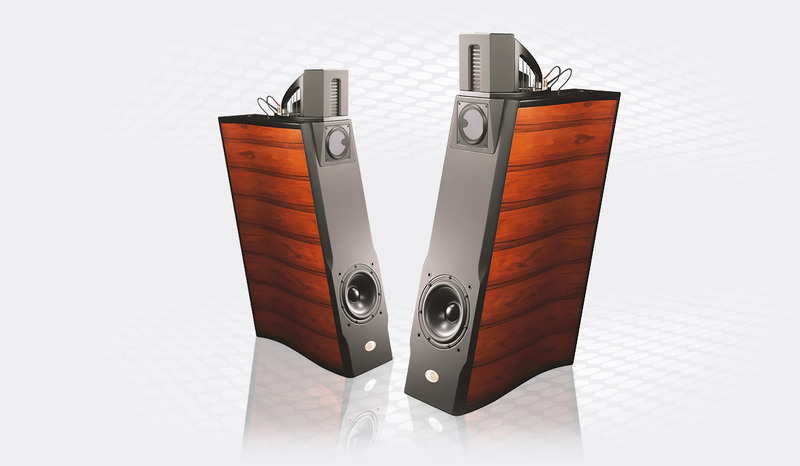 Being in harmony with the environment means you can listen at low volume and relax with the soft sounds of the first watt or excited raising the volume recreating the feeling of strength and dynamic sound live. 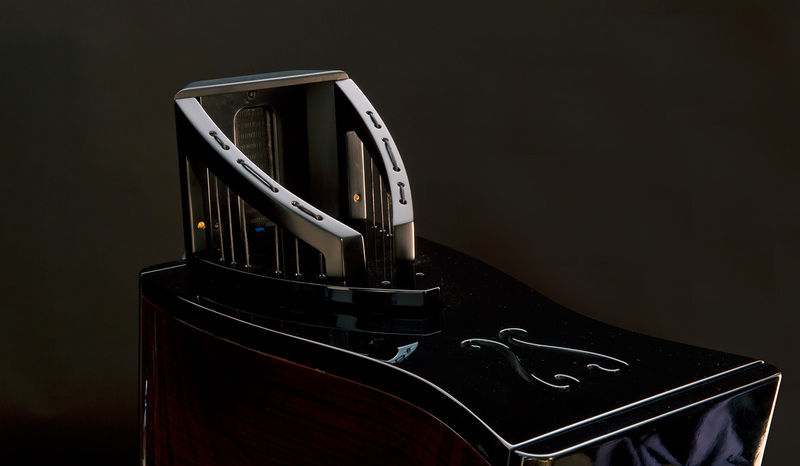 The particular double S inclined shape of cabinet to tune the timing of the sound and reverberations and preserve its harmonics without coloring but without losing any of the essence of music. Each incision returned with all of the content of what is music and sounds of that moment… of that instant.. .. for that moment you feel emotion. The combination of sounds between the drivers used in the Orchestra project is researched and exclusive, the only way to get the time of ” sound “and time of ” silence” consistent low-frequency harmonics up to the most slender of the higher tones . 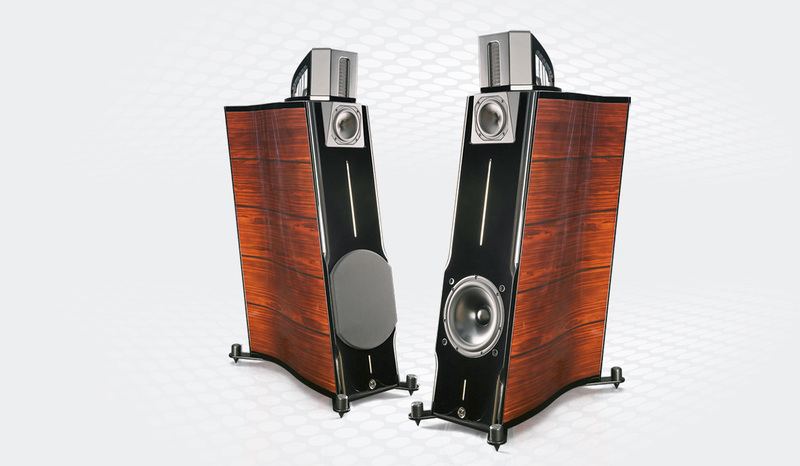 The Heil tweeter or better known as Air Motion Transformer recognized as one of the best drivers for the high frequencies of all time. The increased speed with which creates sound and the speed with which returns in the silence are unreachable from others drivers and give a sense of cleanliness and naturalness to the sound and its harmonics . The emission bipolar increases three-dimensionality and the feeling of having in front us the music and its performers. The midrange Accuton of new technology , ultra-light and ultra-powerful magnets to control the damping factor (silence ) in a consistent manner at the time of the tweeter granted in a dedicated cabinet releases overtones and reverberations range of media through the grooves and slits in them in the back of the cabinet togheter with the sounds of the AMT . 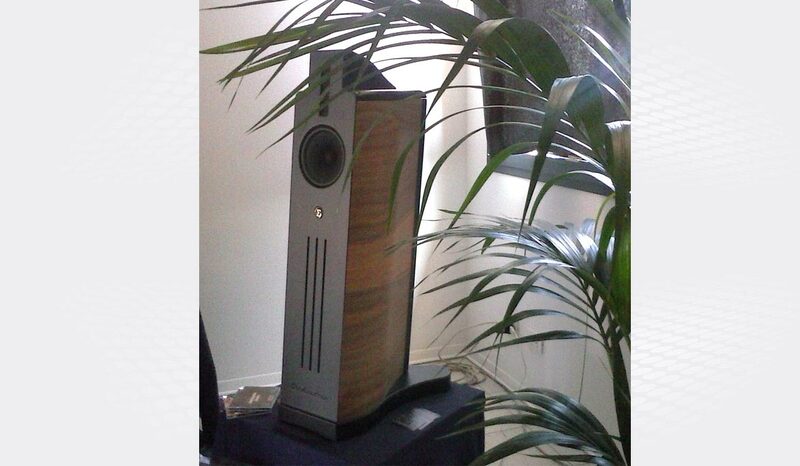 The woofer built handcrafted Scan Speak Revelator series of last generation tuned in particular the cabinet agreed to harmonize low and very low frequencies up to the limits of hearing . The crossover, hidden , artisan , simple sometimes trivial …. Because he was born on the drivers chosen and these are chosen for the type of cross. But give a first order 6Db per octave , a system that has always been preferred in our cross , a sound and a character in a speaker that uses drivers ” complicated ” required research ,time and passion . The electric pulsed heart of the system sits between the ” command” amplifier and the ” performers ” or ” drivers” of movement that creates the sound through their membranes . Phase , impedance curves , frequency response , are analyzed and choice working of sound and of analysis and at the same time , thanks to the analysis system created at the beginning of Extreme Audio and always saw that discoveries of what is sound from what is annoyance . The passion and the search for the ” best ” of ‘ ” emotion ” saw give importance to the most different types of crossover components from the best paper oil of the highest quality to Polypropylene of last generation or very low loss inductors , each compatible and synergistic with a project , to a sound. Everything transmitted to drivers from the cables , the ” arteries ” of the beating heart that give the right timing . So these are White Gold Cable and patent LTI . Who most of us have seen the birth of cables and conductors in synergy with crossover design and driver . Perfect fusion of aesthetic forms at the mere sound with diagonal grooves and curves to give the energy distribution emitted by the drivers. Multilayered and MDF wood species with high density of tasks, each with different thicknesses of absorbing vibrations or resonators for hot zones sound that intersect each other in the project Orchestra. Built by the best cabinet-makers entirely from Veneto in Italy and painted with super high gloss lacquer. Orchestra can be built with wood Rosewood, Walnut, Ebony, Cherry and Oak. 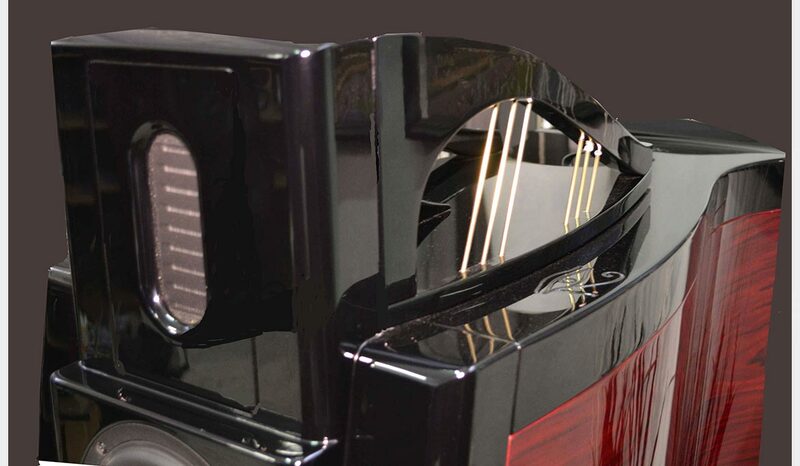 Front and rear can be obtained with thick leather finely crafted as an alternative to the classic matt black and lacquered black hand-brushed mirror effect. 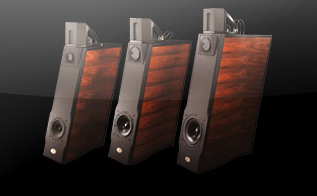 An array of 3 types-speaker built in scale between them implemented perfectly with the most different listening environments. All this to give back the emotion of the music, the sounds, the orchestra in “our” moments and in our spaces. 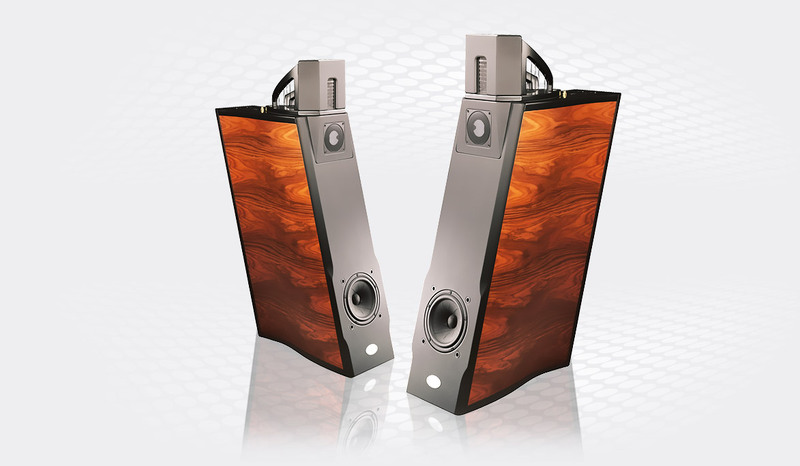 Being in harmony with the environment means you can listen at low volume and relax with the soft sounds of the first excited watts or raising the volume to recreate the feeling of strength and dynamic sound live. Each incision returned with all of the content of what is music and sounds of the moment …of the instant .. for that moment you feel emotion. Tipo diffusore: 2 vie bass-reflex. Potenza amplificazione: da 8 watt a 130 watt. Power amplifier: from 40 watts to 150 watts.